I find the internet to be a very interesting place. There are bits of me floating all over the place - here on my blog, in the comments of a myriad of other bloggers, in social networking nooks and crannies, in online events. And it never really goes away - stuff you think is gone can be tracked down and revisited, even if it is in an altered form. A couple of days ago, I received a comment from one of my favourite all time bloggers, Claudia Ceraso. Claudia lives in Argentina, is bilingual, and does not post very often on her blog but her posts were some of the best and most thought provoking that I had read. The ideas she was exploring about networked learning, about online identity and the way ideas and thinking can be shaped by online interactions were ponderous and helped remold my own thinking. And so her comment prompted me to go back and check out how our online exchanges helped shape out emerging ideas. Another of her posts linked back to a post from Alan Levine who I was lucky enough to have a meal with about 8 years ago thanks to Michael Coghlan. Alan does great stuff online that I aspire to and that I feel represents all of the potential the internet offers learners. Alan is open, he shares, he experiments, he openly documents and he creates. He interacts with all who cross his virtual (and real life) paths without any pecking order. When I read educators on Twitter seeking to stake their names next to virtual events, or to package up and promote their piece of entrepreneurial digimedia (no links as to not cause controversy or get others offside), I think that Alan is the antithesis of that state of mind. His spirit and his innovative approach is where I want (or would like) to be at. Another blogger interacting with Alan a few years was Jennifer Dalby. In my opinion, she was a great blogger. Awesome thought provoking stuff that she seemed to be never really happy with because she ended taking the whole lot down. Jen wrote this really awesome series about online communities, social media and networked learning called the Onramp Installments, and when she pulled the plug on her blog, it seemed to disappear. However, a quick Google of "injenuity onramp" found them neatly archived at her blog which was a pleasant surprise. What I was going to suggest was the use of the Wayback Machine which is an amazing meg-archive of a lot of digital stuff. As long as you know the URL of a long lost site, you can punch that in and see what was captured over the past decade or so. If I type in my blog's URL, I can see 206 captures since 2006. It preserves quite a lot including the theme I was using at the time. Another one of my favourite bloggers was Doug Noon, an elementary school teacher from Fairbanks, Alaska. He hosted his own blog so when he took it down, it was gone for good. Except I can still revisit his writings on the Wayback Machine. Thankfully, he still freely posts his beautiful pictures of Alaska via his Flickr account. Now I don't know what prompted him to wind up his blogging so I won't be be linking to any of his digital contributions here but suffice to say, if you have any digital digging skills there are many, many sites that can come back to life via the Wayback Machine. Odds are that eventually it might be the only place to check out this post in the future! Posted in Blogging, Internet on September 22, 2015 by Graham. 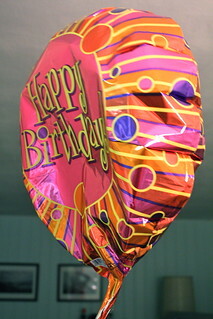 My blog had its tenth birthday last month. And probably, as I treat my actual birthday, I didn't really pay it much attention. I had thoughts about doing a post on the actual day but didn't really have something to say. I even thought about doing a give-away or a competition, but I have a feeling that the days of readers numbering in the hundreds (probably down to single figures now) are long gone. But ten years is a significant slab of time. I started writing here because my school at the time had just installed interactive whiteboards and I figured that blogging might have been a good way to connect to others to get ideas and advice in their best use for learning. What I did stumble into was networked learning, exposure to innovative minds and a handy ringside seat into the broader development of educators delving into social media. I don't blog now nearly as much as I did back then. But I have been able to interact with many great thinkers and innovators - some who still influence my thinking to this day. Certainly, there were many well established edubloggers around when I started this journey so I am certainly no pioneer. Along with Michael Coghlan and Mike Seyfang, I was one of the earlier South Australian bloggers flexing our developing social media muscles. When I think about the early edubloggers I was reading, many were well established in their craft - if you aren't aware of Stephen Downes', Nancy White's and Alan Levine's amazing bodies of work, then you need to take the time meander down their well established digital paths. George Siemens may well be hailed as the mind behind Connectivism as a learning theory, but Leigh Blackall deserves as least as much acknowledgement as an active mind developing awareness about Networked Learning. If you don't believe me, check out the Revision History tab on the Wikipedia entry to see how much time he has put in there. He (along with Alex Hayes) was the first to expose me to the concept of "free ranging" showing how one's learning can be stored in a range of digital depositories. This was a concept that he continues to use - it might explain why his work isn't cited by "experts" because he actually practices his ideas rather than just theorise from a traditional academic viewpoint. I strongly believe that Leigh's name and ideas should be more widely known and acknowledged in the Australian edtech community. But I suppose he isn't founding edtech Twitter hashtags, or being an "edupreneur" so the importance of his ideas are somewhat neglected. Speaking of Twitter, I was an early educator user, signing up for my account back in March 2007. No #hashtagchats, no "Welcome to my PLN" autoreplies, no inserted ads or "while you were away" reminders. Not many Australians in the first few years either - and my Twitter connections were basically bloggers who I was already reading. After a year or so, I did start to see some clever Twitter only educators start to leverage the tool in new ways which has led to the massive info-stream that you get nowadays. I've always thought that you only add a connection that adds to your learning so I have never felt the need to follow back. And if I don't add much to your learning, then perhaps I should be cut loose from your Following list as well. It is pretty cool that I can look back at my state_of_brain over the period of ten years. I have engaged with so many digital learners and my own learning has been super fast tracked that I take the connection for granted. Even in 2015, I encounter adults who are amazed at how quickly I can find what I want online, how I can reference some many other great thinkers so quickly - and I am amazed that what I do isn't just commonplace in educators anyway. It should be - I am no one special. If I can be connected and learning, anyone can. Ten years here at my favourite Edublogs haunt proves it. Posted in Blogging, Internet, Learning on September 11, 2015 by Graham. Feedly has replaced my Google Reader as the place to read blog posts from my wide array of learning sources. There's a handy little feature that enables you to Save For Later. I use this for posts from bloggers who have written something cool that I either find challenging and want to explore further, or in the case of this post, they have managed to write about an issue that I've been thinking about in a very clear and concise way. Simply, they have said it better than I could. So, I thought I would share some of these now. How Language Shapes Solutions - John Spencer. Ultimately, we have these intense conflicts in education that begin with the implied metaphors. The hardest thing is that it's so easy to forget that other people are using language tied to a metaphor that is vastly different from your own. What feels cold an impersonal to some makes sense to others. What feels shallow and subject to some feels warm and human to others. I have problems with other people's words a lot of the time. Well, more accurately, I find it frustrating that a phrase or snippet of language can be bandied around social media as it is universally understood or accepted. I don't like the over-frequent use of the acronym PLN as one example especially when phrases like "welcome to my PLN" and "thanks to my PLN" oversimplify and narrow the concept of people connecting online for the purposes of sharing and interacting with each other. I dislike the word "edupreneur" because it sounds exploitative and gives off a vibe that being an educator isn't enough - one must transcend that and be an "edupreneur"(said aloud in a sarcastic tone). For me, an entrepreneur is someone seeking business opportunities in new territory and buys into that myth of modern consumerism that everyone can be rich and successful when the reality is that for rich people to exist, the poor must be the ones who lose out. For me, I can't combine those mental images with my self perceived role of educator as working for a social good - the words fight against each other. So, call me an "edupreneur" and I'll probably be insulted. As for PLN, I just see myself as participating in networked learning. PLN is just a way of trying to make a group out of a bunch of digital connections. I worry that we’ve got to the point we’re all so used to being spoonfed content, that we’ve lost something along the way. Genuine conversation. One of the things that drew me into blogging was the ability to connect, as you followed a person’s writing over a period of weeks, months and years you got to know the writers as people. There are so many people I’ve met, reconnected with and stay in contact with through blogging and tweeting. And I feel like that community has been lost. We’ve become less attached to conversations and people and are now much more likely to turn to quick fixes. The rise of the expert bloggers and tweeters with thousands of follows has permanently changed the tone of edublogging and not for the better. A lot of the content showing up online isn’t conversational in nature – they are standalone pieces designed to be re-shared through vast social networks. I like the fact that Stephanie links to my good friend, Tom Barrett, in the middle of this section. Because the only way that I know Tom is through the conversational medium of blogging - without that connection, we would be just two Twitter handles occasionally crossing paths. Stephanie makes some really good points throughout her post and points to many other great learning thinkers in the process. I just think she sums things up a lot of my feelings in a really concise way. And it just occurred to me, there are some educators out there who think Twitter = PLN! Most people who do a search on their name come to realise that the search result is essentially the first page of their online identity – their folio. It could be personal, it could be professional, often it’s both. Their next realisation might be that the way they work online, the processes, platforms, linkages and associations in the data that they generate, all has an impact on their portfolio-as-a-search-result. Their search terms and saved bookmarks, the media they upload and download, their playlists, click-through history, viewing times, purchase history, GPS location, and strength of linkage to other people, collaborators and projects. All this data is built up around us as we work online, and can be used to create, shape and grow a personalised and professional workspace. It can be harnessed to improve the quality and efficiency of our work. Our search results on topics of inquiry can become more targeted, or recommendations and linkages can be made more relevant. This includes advertisers and surveillance agencies of course, which at this point in time at least, we might consider as our symbiotic relationship. Read that bit and you realise that PLN is too simplistic a term to describe what is really going on every time you use the internet. As regular readers will know, I have the deepest respect for Leigh as a thinker and analyser of online learning and wish that anyone involved in education trying to leverage the internet in any way would go and familiarise themselves with his huge body of work. He really is one of the great minds of the last twenty years or so, deserving as much (if not more) credit than many of the higher profile people commonly cited in online spaces. To keep things manageable, I'll share one more Save. You also cannot always be positive. Sometimes you have to be point out flaws, be a critical friend, or simply provide balance. But you can do it professionally and after you have established yourself as a trusted entity. Some people might label providing an opposing view as “negativity” and the author advises disconnecting with it. This is not always advisable because you might suffer from group think or delude yourself into thinking that there is no thought contrary to your own. There are days when posting on Twitter is like yelling into a giant fan. No one can hear me against all that air. Now I have no idea how that links to Ashley's post at all but I do like the fact that I don't have to be agreeable or follow other people's rules of conduct when using social media. As long I have my own personal code of conduct to follow, I am free to express myself in the manner of my choosing. But now, the right thing for me to do would be to go and give these people a bit of feedback via the comments on their blogs, because a Twitter shoutout does not do their work justice. Posted in Blogging, Internet, Social Media on July 12, 2015 by Graham. I've just finished reading a blog post by Dean Shareski on being a more regular blogger. Knowing Dean a little bit, I actually thought it may have been about fibre and looking after your bowel. But a section of the post resonated with a gnawing disconnect that I've been experiencing with Twitter as forum for connection. For others I fear twitter got in the way and now instead of meal sized portions of learning, all we're getting is table scraps and candy. 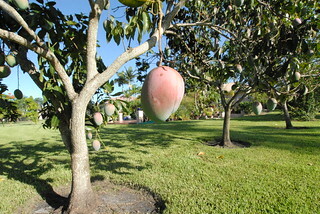 For me, Twitter is a low hanging fruit for online thinking and learning. I cringe inwardly a little when someone pronounces Twitter as the best PD they've ever had. I wonder how it is that they have had such a barren run throughout their career for this to be true. Maybe because I'm not in with any particular social group but I mainly see people pointing to links of stuff that someone else created, sharing in jokes (which are out jokes to me), fawning over big name edublogger types, shout outs and #hashtag mania. To paraphrase Jerry Seinfeld, not that there's anything wrong with all of that, but it is a far cry from sitting down over a blog post and putting your own words, thoughts and ideas out there using as many characters as you want to get the job done. I can respect any one who is prepared to do that because it does seem that some of the more vocal Twitter fans on my twitterstream are reluctant to be bloggers. Deep down, writing in depth is a commitment and a challenge that they shy away from and espousing Twitter as the premier networked learning outlet (often referred to as their PLN) looks like a diversion away from that scenario. Here in Adelaide at a number of departmental workshops and conferences, organisers announce that the event will "be on Twitter" and educators who don't normally engage with social media (apart from Facebook but that's not for learning, now is it?) sign up for the day and have a go at "tweeting". These accounts are then abandoned as they all return back to their day jobs and bursting email inboxes. And I can't think of any pearls of wisdom from any of these events that have benefitted my learning or triggered further thinking. But blogging is different for me. I can recall various blog posts that have turned on the virtual light bulb for me with ideas that couldn't possibly be contained within 140 characters. From Christian Long's Future of Learning Manifesto to Leigh Blackall's Teaching Is Dead to Artichoke's Calls for Gendered Group Think about Web2.0 and Claudia Ceraso's Some thoughts on identity -particularly mine - just to name a near-handful. These posts opened up my mind to new persectives, made me reconsider what I was doing in terms of learning for myself and the staff and students with whom I work, and inspired me to strive to write for insightful and challenging purposes. I can't do any of that in a Tweet. About all I can manage to do in a Tweet is get people offside. My attempts at conferences to be provocative have been interpreted by others as sounding snarky and negative. So, some people can feast reasonably well from the ground level branches of networked learning or wait for those who take the time and effort to climb that metaphorical tree of learning to drop them down a tasty morsel or two - or they can plant their own tree, watch it grow and then climb up high to where the most nutritious fruit is and trade them with others who've planted their virtual learning tree nearby. OK, I'll stop now. The metaphor is starting to get a bit stretched and thin now. Like my efforts on Twitter. Posted in Blogging, Learning on October 3, 2012 by Graham. Whenever I set aside time to check through my blog feeds, I will invariably find a sentence or paragraph that really resonates and has me thinking, "I wish I had written that." But I suppose the good thing about finding these succinctly written pearls of wisdom is that my colleagues are more likely to take the message on board if the quote comes from someone other than me! I suppose the only rider on this one is that this idea only works effectively on the premise that the average teacher will read and browse enough online in order to develop a deep enough back pocket to call upon. Posted in Blogging, Resources on April 9, 2012 by Graham. I last wrote a blog post nine days ago. I know I'm not setting aside time to write here like I used to - only 31 posts here in 2011, compared to 41 at the same time in 2010, compared to 55 in 2009, compared to 59 in 2008 and so on and so on ... you get the picture. Anyway, what I'm experiencing is also what A list blogger, Joi Ito, has recently blogged about . Interestingly, the only feedback I got from that last post came via Twitter. Leaving a comment here doesn't broadcast as widely as a Twitter shout out - even though there is something nice about getting the feedback on my own site. And then I read another A-lister, Hugh MacLeod's blog post the other day, and his words rang out true for me. I like it. Not that I'm ditching any of my social media hangouts because no one could ever accuse me of being on Twitter or Facebook too much - but I've been here too seldom of late. And I know that actions speak louder than words in terms of arresting the posting slide here - but as everyone knows, on a blog, words are actions! Posted in Blogging on August 28, 2011 by Graham. Whose Learning Should I Be Documenting, Anyway? I started a blog post intending to reflect on the first week of the 2011 school year. I scrubbed that draft last night after staring at the first paragraph for about twenty minutes. It was forced reporting and there were no anecdotes that required documentation in digital format. Perhaps it's too early ... or maybe, this blog is more about my own learning and my ephemeral interests rather than my own impact on the students under my charge. Daily, the blogs I subscribe bring me new avenues to explore and to connect to. I can browse art and design ideas, shake my head at the insanity that is US education reform or think through potential ideas to bring into my own classroom. I'm lucky enough to work at a school where the professional learning is of a high quality and sometimes, it is draining enough to do that justice without trying to pull in all of the exciting leads I get from the network. We've been implementing Assessment for Learning, are about to delve into mathematics curricular renewal using George Booker's Teaching Primary Mathematics, have our department's Teaching for Effective Learning document at the ready and continue to become better at implementing Inquiry Learning in our classrooms. So when Dan Meyer points to an outstanding Maths resource, I am interested. But I have to weigh up the benefit to my own practice and the time it will take away from me coming to grips with my own school's choice of maths direction which will be tightly aligned to the incoming Australian Curriculum. And I still owe Dina Strasser a properly worded response in the comments section of this blog post, but I need to delve more deeply and know what I'm supposedly using on a daily basis more deeply before trying to describe the contrasts between her own approach and an approach that we are trying to make an embedded part of my school's operation. So, if I find something interesting in what I have to come to grips with in my own professional existence, I'll try and blog about it. I'd like to make more of an effort to participate in more online events like K12 Online or even ds106 and I need to be OK with the fact that it may be purely self indulgent on my part and that focussing on that is a viable thing to be documenting. 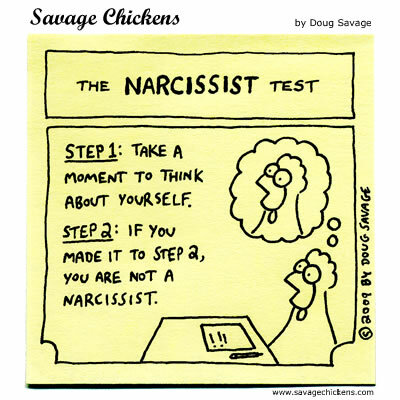 The line between narcissism and sharing can be a very thin one. Posted in Blogging, Personal Reflections on February 6, 2011 by Graham. Personally, both the K12 Online Conference and the Edublog Awards are held at shocking times of the year. I couldn't possibly be any busier when both events are happening. October sees us gearing up for the sprint to the end of the year - planning, writing reports and then November hits like a ton of bricks with the finishing up of reports, Year 7 graduation prep, end of school year events and would you know it, I didn't get to even nominate anyone at all. 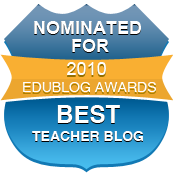 Best Individual Edublog 2010 - a few good choices here, but I must admit that I have really enjoyed reading Michael Doyle's Science Teacher blog. Best individual tweeter 2010 - for me, has to be @deangroom. I am a haphazard and infrequent user of twitter but Dean's mix of personal observations, humorous banter combined with quality pointers to links of interest make him the best out there. Plus he'll often @grahamwegner me, which helps make me feel included and semi-useful. I don't really like group blogs so I gave them a miss and didn't recognise a n y o n e on the new blog list. I skipped through the class and student blog noms because they made me feel guilty that I haven't fostered my own class blog and student blogs as much as I should have this year and blew off the best resource sharing blog while I was at it. Most Influential Blog Post 2010 - I picked Lee Kolbert's "I'm Not Who You Think I Am." Regardless of which side of the fence you sit on philosophically, this post really opened up the floodgates on debating about what a quality teacher does or is allowed to do. Much more than some of the deliberately provocative options on this list, Lee at least put her heart out for the world to see and was truly open about what she does. Very cool. Best Librarian blog is still Doug Johnson and then I skimmed down to the lifetime achievement award. A few worthy nominees here, but this year my vote goes out to the Blogfather himself, Will Richardson. Posted in Blogging on December 9, 2010 by Graham.